Just 9 miles from Breckenridge, the Frisco Adventure Park offers snow tubing, a beginner ski and ride hill, horse-drawn sleigh rides and snowshoeing and Nordic skiing, all in one convenient location. The tubing hill boasts multiple lanes of fun next to a beginner ski and ride hill to start learning the basics before taking on the Colorado ski resorts. The Nordic Center provides over 27k of Nordic trails and 20k of snowshoe trails. 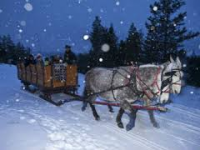 Two Below Zero Sleigh Rides features scenic and dinner sleigh rides. All of these unique adventures are adjacent to ample parking and the beautiful Frisco Adventure Park Day Lodge where you can warm up and enjoy some good company over a hot drink.